Waxed dental floss with mint flavour, 50m. This dental floss slides perfectly through the contact points between the teeth. Its wax coating makes for easy control. This innovative dental tape is made of extremely tear-resistant PTFE tape. Thanks to this PTFE coating, it also slides particularly easily through the contact points. 35 m.
Voor reiniging van orthodontische apparatuur en implantaten. Zeer dikke "wollige" draad met brugnaald aan beide uiteinden. Erg practisch: de naalden worden niet zacht door het speeksel en blijven dus sterk, zonder op te zwellen. 25 cm. 50 draden met een naald aan beide uiteinden. This fleecy floss is very fine and exceptionally practical thanks to its division into three: threader, fine fleecy thread and dental floss make a tape 70 cm long. 100 fleecy threads, precut. Particularly thick fleecy thread with threader, thick fleecy thread and dental floss in one piece. 70 cm long. 30 fleecy threads, precut. For people who mainly need a fleecy thread, but no dental floss: Very thick fleecy thread with threader at both ends. 25 cm. 30 fleecy threads, precut. Rigid, fine nylon toothpick with a flocked tip, 10 pcs. Flexible plastic toothpicks, 50 pcs. Front teeth and dental floss: yes. Most of the other interdental spaces: interdental brushes. It’s best to let your dentist or dental hygienist decide. In special cases: textured floss or Implant-Saver are often the solution. 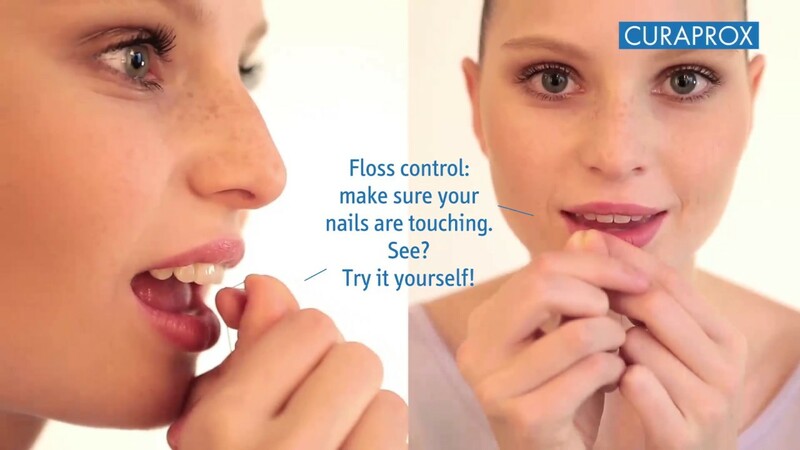 Floss used in interdental spaces where teeth are tightly packed together can be very effective. However, not all interdental spaces are the same and so consideration needs to be given to the best cleaning method for all. To be honest, we actually have three reasons for disliking dental floss: firstly, it’s not easy to use effectively. Secondly, it stretches tautly across concave surfaces and often fails to clean them properly, if at all. Thirdly, it can even cut into the gum causing bleeding. However saying this, people who know how to use dental floss correctly are able to clean the gaps that even the smallest interdental brush, such as our CPS 06 prime, is unable to reach: between the front teeth and some of the side teeth. Ask your dental professional which gaps you should clean with dental floss and which to clean with an interdental brush, making sure you are clear on which size brush to use where. Take a piece of dental floss about 50 cm long, put both ends together and make a double knot. Try to make a loop that goes fairly closely over four fingers. If the loop is too big, the dental floss is difficult to control. There should only be a minimum gap between thumb and index finger and this allows you to control the dental floss safely and easily without cutting heavily into the gum. With this minimum gap, you can now control the dental floss safely and easily. The front teeth, particularly the lower ones, are often very close together. So close that not even our CPS prime 06 interdental brush can be used. Dental floss is perfect in cases like these. Dental floss can also be very useful for implant care; fleecy thread is recommended for this, but always remember to use it correctly and carefully. The gum line around implants is a particularly critical area – and thus needs particularly careful cleaning. In a completely new way, the Implant-Saver ensures sulcus cleanliness: this floss is elastic and woven with fleecy microfiber. Thread it over the implant – at the gum line - the Implant-Saver is easy to tension and release. The resultant cleaning movement is gentle yet efficient. For a clean sulcus and long-life implants. Crowns, bridges, implants as well as braces - they all represent very special challenges when cleaning. CURAPROX now has a very special dental floss: fleecy thread DF 845 implant & braces. The fleecy central area fills the space gently and cleans with maximum efficiency - and is particularly easy to use: threaders at both ends make it easy to access even the narrowest gaps between the teeth and the fleecy section slides just as easily through them as it does under the wires fitted to orthodontic devices such as braces. And remember: threaders are not softened by saliva and thus remain strong without swelling up. And when travelling, thanks to the handy dental floss box, DF 845 implant & braces is always on hand. Since Lucky Luke stopped smoking, he has been coolly chewing on a blade of grass. However, grass would be too soft to replace a toothpick. Nor is wood the right material – it becomes ragged and can be harmful. This is why our toothpicks are made of quite different materials. Maybe that’s cool, too, but it’s definitely safe and useful. A decision we have taken for you: we do not have any unwaxed dental floss in our product range. The risk of injury posed by unwaxed dental floss is too great. However, waxed dental floss slides perfectly through the contact points and thus reduces the risk of injury. Apart from that, you have a choice: with mint flavour, as fleecy thread in different thicknesses, with or without integral dental floss, as dental tape or floss, with a PTFE coating or as a combination of toothpick and dental floss. The toothpick TP 930 Brushpic is made of nylon: rigid, fine and with a flocked tip. The tooth and tartar pick TP 945 Tartar-stix is highly innovative: made of high-grade mineralised special synthetic material. And the TP 917 Dentastix made of flexible synthetic material is anything but ordinary.